Oh, I’m so tired of the news… And I’m also tired of so many celebrities passing away. The War Doctor? Laura Petrie? Damn. I’m looking for things to make me feel better for a while. I’d post cat pictures if I had any, but alas. No cats. As I found out on Facebook, NASA has made all of the scientific research it funds available online, for free, for everyone. This is excellent. I approve! But a very interesting thing about this, that I did not realize until I followed the link to the database: they are using PubMed Central to do it. PMC is a database of biomedical and life-sciences articles. It’s the contents of the US National Institutes of Health’s National Library of Medicine — full text, full access. So… what is the NASA research doing there? It’s not just the NASA-funded biomedical research they’ve uploaded (like this one about cardiovascular disease in Lunar astronauts); it’s also non-medical articles (like this one about how closely-orbiting super-earth exoplanets can lose their atmospheres). They’ve put it all up on PubMed. Select the explanation that seems most likely to you… Personally, I’m leaning toward number 2. But, result: absolute treasure trove for SF writers! In fact, wait a minute — why am I telling you about this? Some of you are my competition! Yeah, well: still a steerswoman at heart. And speaking of exoplanets, Jason Wang of the Nexus for Exoplanet System Science ( a NASA-sponsored group), and Christian Marois of the National Research Council of Canada’s Herzberg Institute of Astrophysics put together a video of four exoplanets orbiting HR8799. This is from direct observation, folks. Yes, we have come that far. 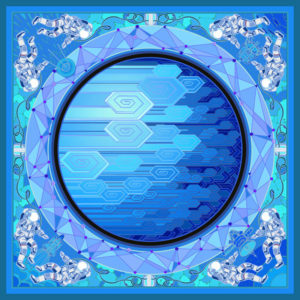 You should head over to the Many Worlds website and check out their story. Of course, nothing can beat the real thing…. 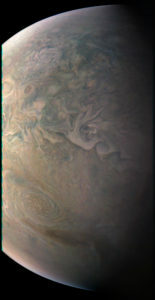 Juno looks at the Red Spot. Well. Back to Book 5. And chores. Yeah, I have to clean up the house a bit, before my sister gets back from Florida. I didn’t get to the march. But some other people did. The New York Times has a collection of images from demonstrations around the country, and the world. Well, I managed to get my stuff organized (more or less, and more less than more) for the Genrettes. We’ll meet over the weekend. You’d think I could chill for a bit, but nope. I’ve now just completed one of those evil Chores of Officaldom, this one relating to my ACA-provided health insurance, and the need to prove that I actually am self-employed and thus cannot prove my income with paycheck stubs because, hey, I don’t get those. Therefore; Spreadsheets! Calculations! Tracking down records of payments and expenses… Tedious and nerve-wracking, but done now. Unless they contact me and request more proof. Well. I’d love to tell you how much I enjoyed Beautiful: the Carole King Musical, but: brain-fried. Short version: Yes, excellent! But I do want to write a longer version. 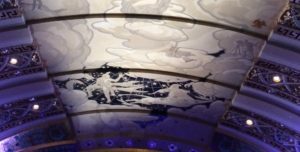 King’s music was a significant presence in the soundtrack of my youth, and seeing it transformed into a stage show was both inspiring and analytically interesting. A quote from the president’s farewell speech. “For too many of us, it’s become safer to retreat into our own bubbles, whether in our neighborhoods or college campuses or places of worship or our social media feeds, surrounded by people who look like us and share the same political outlook and never challenge our assumptions. The rise of naked partisanship, increasing economic and regional stratification, the splintering of our media into a channel for every taste – all this makes this great sorting seem natural, even inevitable. And increasingly, we become so secure in our bubbles that we accept only information, whether true or not, that fits our opinions, instead of basing our opinions on the evidence that’s out there. Back from Florida. To Snow. And plenty of it. Looks like about six to eight inches. 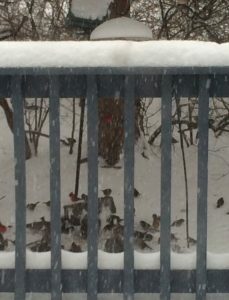 So I was home from the office all yesterday, keeping warm, shoveling the back porch, feeding birds. Restaurant remains open despite inclement weather. Also, digging out my car and Sabine’s, and moving them around periodically while the plow-guy clears off the parking lot section by section. This while trying to extend my writing retreat. Which explains my radio silence. The next meeting of the Fabulous Genrettes is coming up Real Soon Now, and I’m in the hot-seat. So, I’ve got about a week in which to gather this ragged tale into something which, while not graceful, does move. And which, while riddled with holes, does indicate a plot. And which, if not actually coherent, is at least discussable. And I have to get it to the Genrettes in time for them to actually read it before the meeting. Thus, in a bit of a crunch. But a good one. I’m at the office now, but I should head home soon. Weather.com has a warning banner, telling me that it’s going down to 6 degrees Fahrenheit tonight (that’s -14.44 Celsius for the rest of humanity). I’ve got the house heat set higher than is usual for overnight, so that those tricky corners where the pipes are close to the outside walls will get enough warmth to keep them from freezing solid. Which has been a problem in the past. Meanwhile, my sister is in Florida, basking in the — well, at the moment it’s 54 degrees there (12.22 Celsius), but it’s the middle of the night. Tuesday it’s going to go up to 72 where she is. Oh, and with a rip-tide warning. Should she feel like swimming. If so, she should watch out for that rip-tide. Probably a better idea to use the pool. 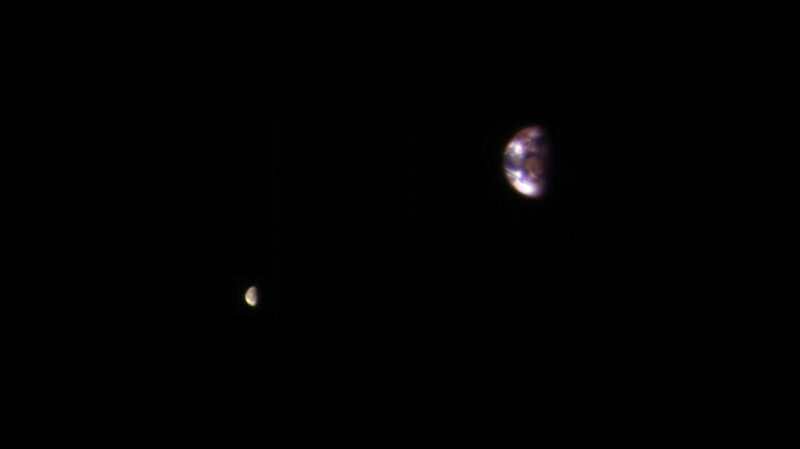 Here’s a picture of Earth from Mars. Earth. And the Moon. From Mars. Courtesy of the Mars Reconnaissance Orbiter. And here’s a link to an article in the New Yorker about Ted Chiang, a writer whose work I love desperately. Yes, I did see Arrival, based on my favorite Ted Chiang story. And so should you. Yes, I want to say things about it! But I’m in a crunch at the moment… So, later? Meanwhile, I’d better get home. It’s crazy cold. 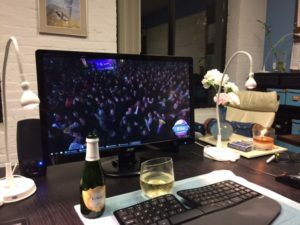 It’s been a long and strange year…. …and I’m pretty sure there’s more on the way for this coming year. I wish I were some sort of wise woman, and could deliver a deep and moving statement that would make everything clear, everything safe, and bring comfort, reassurance and peace to everyone. 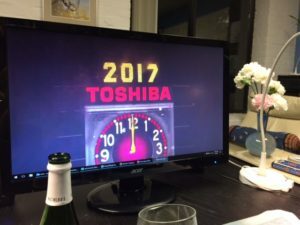 In the coming year –keep your eyes open. Keep your mind engaged. Watch, listen. Pay attention. This new year might be fine, might be perfectly fine; or it might be the worst ever. It will probably be something in between. But if things do start going wrong, don’t leave it to others — if you can, speak up. If you can, step forward. And if you can’t, then just hang on, and stay safe. To all my readers: thank you. And all my best wishes to you and yours. And, hopefully: happy New Year.